The 1950’s produced a number of notable labour-themed pictures (ie. 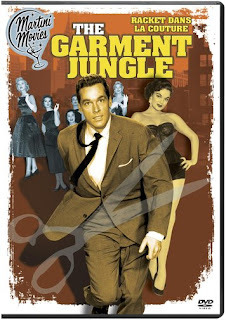 “On the Waterford”) and one of the least known but most entertaining is Vincent Sherman’s “The Garment Jungle”. As the title suggests the setting is the New York fashion industry at a time when unions were moving their way into the sweatshops of the ‘dress-making’ shops in the Garment District. A fight to keep the union out of Walter Mitchell's business results in violence and murder. Kerwin Matthews plays Alan Mitchell, the son of New York City fashion entrepreneur Walter Mitchell (Lee J. Cobb). Alan comes home to join his father in the family business. Immediately Alan gets in the middle of a bitter labour dispute with the local dressmaker's union shop, which has recently taken the life of Walter's business partner. As Alan gets to know the labour leader, Tulio Renata (Robert Loggia), he develops sympathy for Walter's bitter enemies. The conflict causes a rift in their relationship and ultimately brutal violence within the family. The fashion industry milieu provides an interesting setting for this pseudo-noir. The plot doesn't boil as customary with the genre, and the dialogue and characterizations are kept to the side of realism. Instead of genre conventions, the anchor of the film is the reconciliation of father and son. Character actor Lee J. Cobb, who specialized in gruff and imposing men like in “On the Waterfront” or “12 Angry Men”, is the clear antagonist early on. As his son enters the business and sees both sides of the labour battle, the batte becomes father against son. Walter Mitchell, though stubborn, is given enough depth to understand his predicament. A self-made man, in a family-owned business, who legitimately wants to keep full control of his company. But understandably he’s out of touch with the realities of big business. And so Mitchell’s redemption and then quick punishment hit all the right dramatic buttons. By the end Walter Mitchell changes from bullish, profit-hungry slave driver to compassionate working class hero - a classic arc in literature and a strong throughline which elevates this film beyond mere pulp fiction. Though the central conflict is about union vs. non-union the film never brings up the issue of the workers, their working conditions or wages. There is no character at the level of seamstresses, or tailors grinding out the work for Mr. Mitchell. Inadvertantly the film could make the point that, in an era of labour-corruption, often worker-well being wasn't always the incentive for unionization. This isn’t the case in this picture though because clearly the filmmakers stand on the left in characterization the organizers as near saintly working class heroes. What's notably absent are any homosexual characters (whether covert or overt). Sure the Production Code was still in full effect, but that never stopped Hollywood from portraying gay characters. Despite being the fashion industry, it's full of hetero-males. Of course, it's also about a dominantly hetero labour organizations, but there is a missed opportunity to show contrasting personalities at work. "The Garment Jungle" turns out to be a surprisingly well-crafted and emotionally involving story about reconciling father and son. Joseph Biroc’s classical and unflashy but crisp B&W cinematography sparkle on a Sony's clean and well-transferred DVD, which is packaged under their "Martini Movies" moniker. Enjoy.